The bus came so we went to the pottery museum in Arguayo and watched a fellow making a cooker. 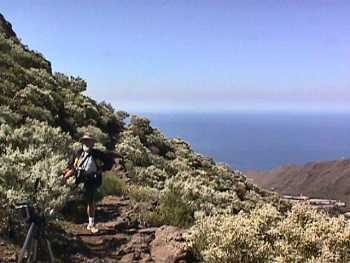 Then we hiked around La Hoya mountain to Santiago del Teide where we caught the bus back to the hotel. It was a fantastically beautiful walk. 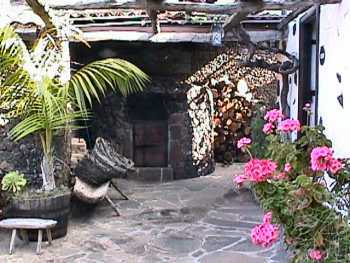 The pottery museum in Argueyo. 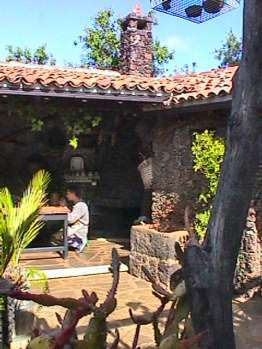 There is a display of old pottery and you can watch the potter using centuries-old methods of working clay. 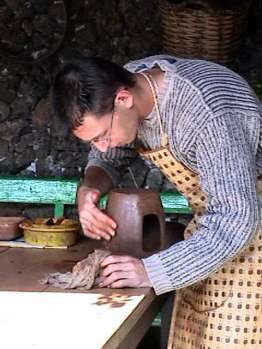 A close-up of the potter at work. He is making a little "stove" for cooking - a small fire is made inside and the pot sits on top. Something similar is used in Germany with a candle inside to keep the teapot hot. The kiln where the pottery is fired. Just above Argueyo we came across this canal for irrigating the fields. The old canals are gradually being replaced by pipes - less water lost to evaporation but not nearly as photogenic. Our path from Argueyo. After a short climb it was quite flat at about 1000 metres above sea level. 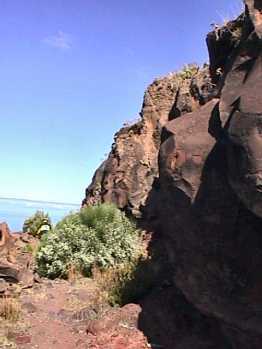 On our right was great chunks of lava (La Hoya mountain) and on our left the sea. 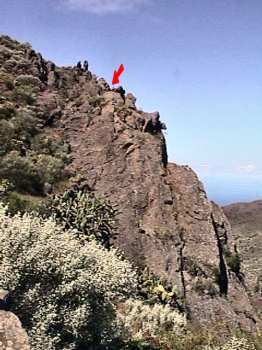 We could see La Palma as well as La Gomera. Right here the hillside is not too steep; sometimes it was almost vertical with a sheer drop on one side of the path. You can just see a corner of Tamaimo, the village above Los Gigantes. We came across that cliff face. It looks much worse at a distance than it really was. We were following an old, well-kept path. 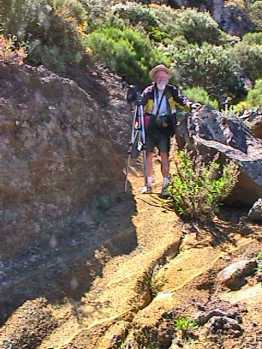 It was probably the main road to Santiago del Teide before the mode of transport changed from donkeys to cars. 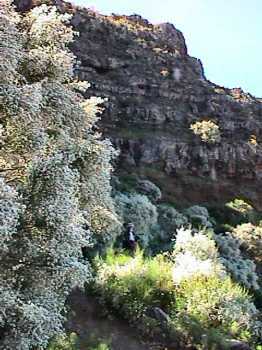 The white-flowered bushes are broom. The mountain sides were covered with it and it smelled so good. How I wish I could have captured the perfume in the photo. We came over that! The red arrow marks the path. What a panorama we had. I swear I did not change the colours in the photo. The sulphur in the rocks makes them so yellow. 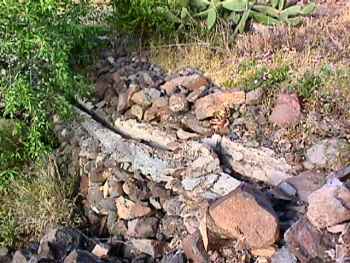 This is the lava flow that stopped just short of Santiago del Teide is 1908. Plants have already found a foothold and it is becoming quite green. 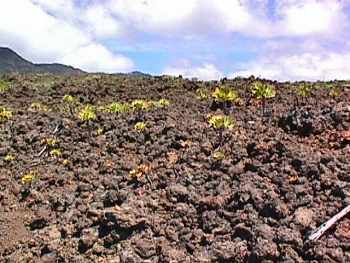 This is the lava flow that stopped just short of Santiago del Teide is 1908. The mountain on the left was the source. In the background is Teide. 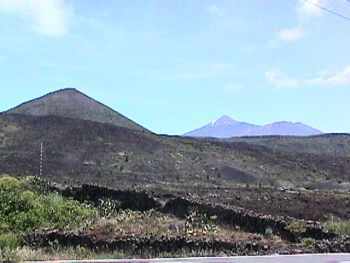 On the right is Pico Viejo, the old peak. In Santiago del Teide we stopped at a bodega for a snack. With the bill we were given glasses of mead made from broom honey. It tasted just like the broom smelled - gorgeous.